Our travels to Vancouver Island which included the BC Summer Games was a time of beautiful weather. The west coast is often thought of as getting lots of rain but many would disagree and there were many weeks with no rain this summer. We definitely had great weather for our stay and I wish to share some of the beautiful sights that Vancouver Island offers. Our ride on the BC Ferries ‘Coastal Inspiration’ left from Tsawwassen terminal and took us through the Georgia Strait while we enjoyed some beautiful scenery of the Coast Mountains far in the distance. Sadly we did not see any sights of marine mammals but we know they are there. Duncan is situated half way between Victoria and Nanaimo on Highway 1. This city of a population just under 5,000 serves 80,000 people within the Cowichan Valley. Also called the City of Totems, it has 80 totems around the city, as well as information on the carvers of these impressive totem poles. A walk around the city will give you plenty of photo opportunities. Duncan is also the smallest city in the nation, just under one square mile in size. This statue located on the waterfront of Nanaimo is called “Admiral of the Fleet”. ‘Black Frank’ helped launch the now famous Bath Tub races in 1967. The pirate costume was worn to promote Nanaimo for many festivities. Nanaimo was referred to as The Sun Porch of Canada, Jewel of the West and Bathtub Capital of the World. Nanaino, like many other cities and towns in Canada, was originally established as a Hudson Bay Trading post. Cannons were used as a defence in those 19th century days, but the original cannons are still being used at a daily cannon firing ceremony at noon. This ceremony, which includes bagpipes, happens every day from May until September. We missed this on our visit, so no photo to share. The waterfront now has several shops and restaurants and interesting to wander along enjoying the sights. Farther along is the park which features entertainment as well as many sculptures by local artists. Following north up Highway 1, also known as the Island Highway, is the original highway on the Island. It weaves along the coastline with several views of the ocean. There is access to nearby islands via ferry, such as Hornby and Denman Island. There is also a freeway inland from Hwy 1, which is a quicker drive between Nanaimo and Campbell River, should one not want to enjoy the waterfront views. The Seymour Narrows once included underwater twin peaks, called Ripple Rock that created many treacherous situations as ships passed through. Many ships and lives were lost in this area. Captain George Vancouver charted these waters in 1792 and said they were the worst waters in the world. In 1958, the twin peaks were blasted, which helped eliminate some of the turbulence. Ripple Rock blast was telecast live on CBC, one of the first live telecasts of a Canadian event. Oyster Bay was where we lived when I started Grade 1. I caught the bus into Campbell River, where Mrs. Baldry taught me. Weekends I remember going down to the beach and playing in the driftwood with friends and fishing out there in a boat with my Dad and brother. I was 5 years old and caught a 5 pound fish, have never forgotten that. Once established as a relief camp for the unemployed during the Depression, Oyster Bay was later purchased by a logging company and became a logging community. Logging was a very dominant business on Vancouver Island and much to my surprise, it is still busy with logging trucks. Logging was what my Dad did for a living so we’d moved around the Island a lot by the time I began school, but this was a long stay for us. I remember it quite well. I remember the old ships out in the water that had been dismantled and used to be a breakwater, although that apparently didn’t work well. These posts in the photo are what is left of the dock where the logging trucks would back onto then drop their load into the water, logs would then be boomed out into the Bay. The homes which once lined the highway at Oyster Bay are no longer there, either. 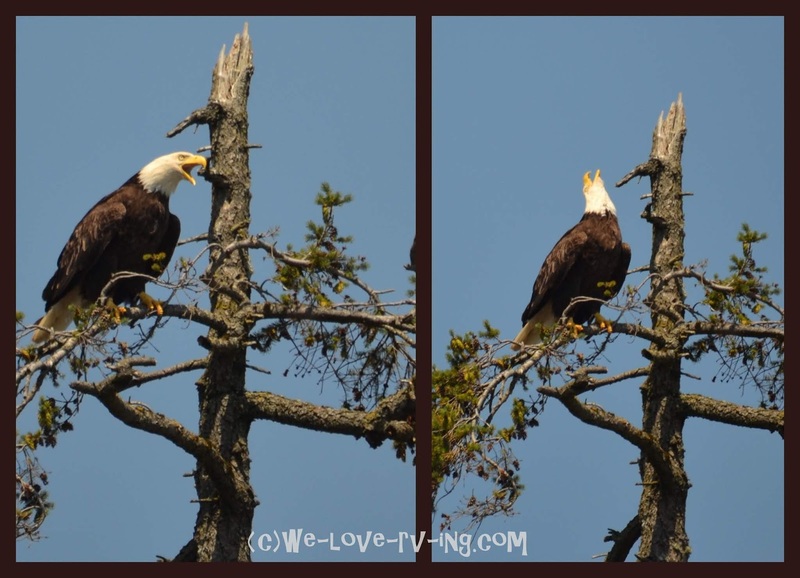 Bald headed eagles are commonly seen on the Island but never do I tire of watching them. This fellow was busy calling someone who didn’t seem to respond. He was across the road from the water and had a good view but he was getting, what seemed to be, quite perturbed at having to keep calling. I enjoyed his performance but wasn’t there to see anyone join him. We were parked in the Thunderbird RV Park on what is called the Tyee Spit and joined friends who graciously toured us around Campbell River to see the sights and enjoy our visit. We saw small float planes coming and going from a nearby base and enjoyed evening walks around the Spit which included seeing this evening sunset. I've barely covered the beautiful Vancouver Island that we love to visit in this rather long page. I have touched several stops that we made on our most recent visit but hope to do more in the future. 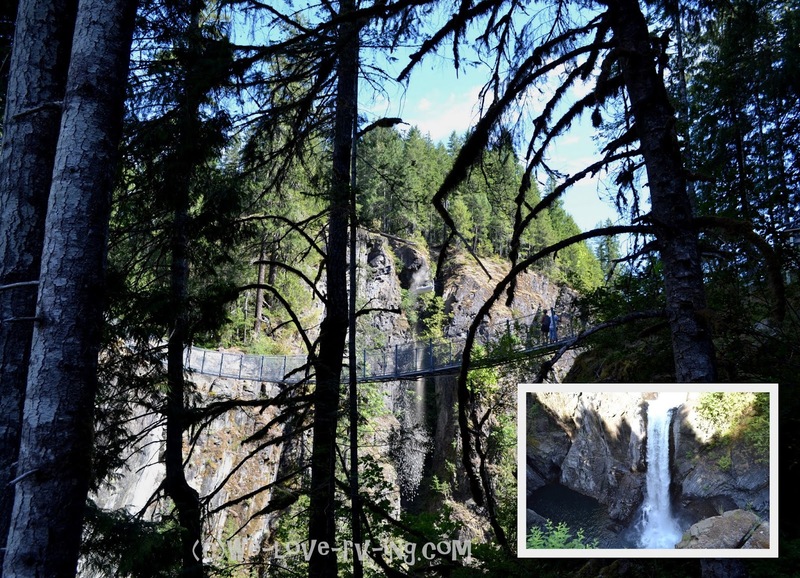 To see more of Vancouver Island, click here. More here. Thanks! I hope you get there, it is so beautiful and so much to see. Love the eagle and Ripple Rock. Takes me back. :-) And the beach at Oyster Bay. Great pics!! love your pic .and and all the info.